We hope you are already registered to join us March 7-9 for our 71st Annual Winter Meeting. This year OOGA is taking a slightly different approach to the structure of our meeting in hopes of giving attendees choices to concentrate on the topics they’re interested in the most. This will come in a two-pronged approach, the first is to bring with very good speakers to provide information to our members. In that vein, this year’s keynote luncheon speaker is Brian Kilmeade, co-host of Fox News’ morning show, Fox & Friends, as well as host of Fox News Radio’s Kilmeade and Friends. The second component is several breakout sessions; this will look at some different issues and provide an arena to have in-depth discussions. This year’s event we are really looking to give attendees the choice of what they want to hear, to provide some additional benefit. This format is member driven with a new focus on OOGA committee-established issues. 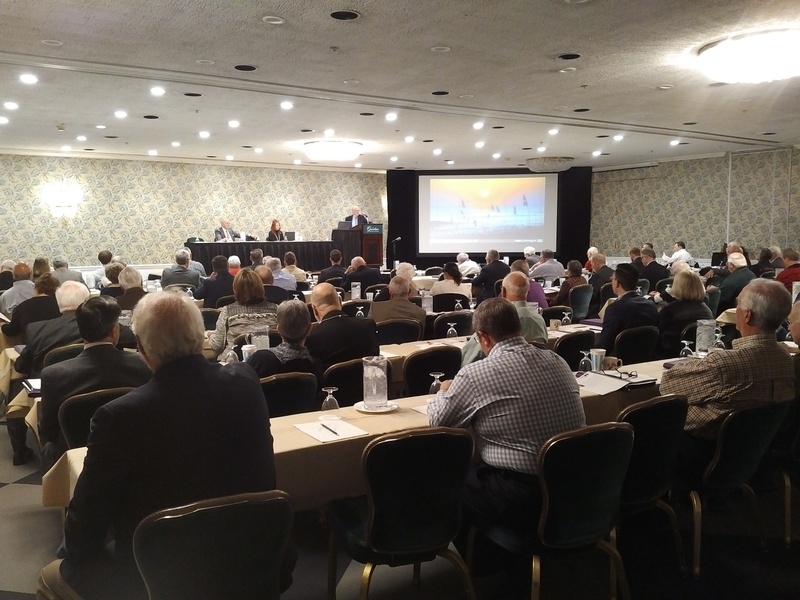 There will be a lot of committee work at the Winter Meeting, and not just limited to the people in those committees, it will be open to everyone. To this end, the breakout sessions will feature high-level speakers providing attendees with the opportunity for direct conversation and questions. Speaking during these breakout sessions are Chief Rick Simmers (Chief, ODNR’s Division of Oil and Gas Resources Management), Chairman Asim Haque (Chair, Public Utilities Commission of Ohio), Greg Wrightstone (Author, “Inconvenient Facts”), Lee Fuller (Independent Petroleum Association of America), David Dulak (Eureka Midstream) and others. General session speakers during the meeting include the annual DeBrosse Report, which details Ohio oil and gas activities, Jerry James (Shale Crescent), Allen Brooks (PPHB Energy Investment Banking) and Ohio gubernatorial candidates Attorney General Mike DeWine and Lt. Governor Mary Taylor, amongst others. 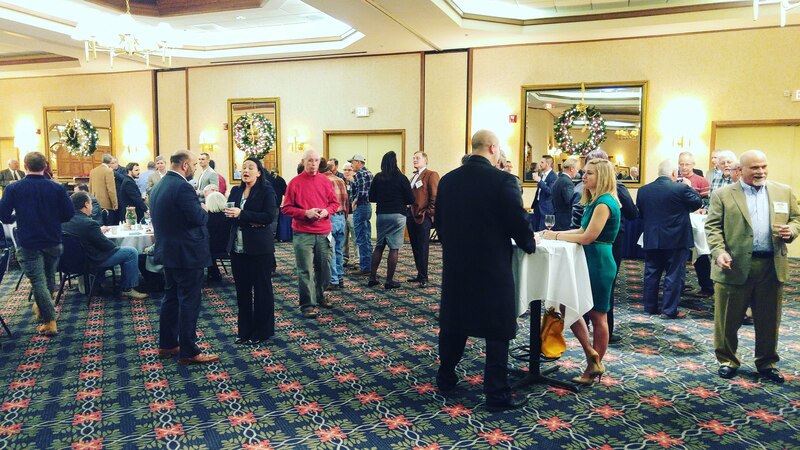 Traditional events, such as the President’s Reception, Ohio Oil & Gas Producers Fund Reception, and networking breakfasts will provide attendees with ample opportunities to interact with others within the industry. Finally, prior to the official start of the event, the 9th Ohio Oil and Gas Association Hall of Fame Dinner & Ceremony will be held on the evening of March 7 to honor and induct a new 13 member class to its ranks. This event, established in 1987, is now held every four years to recognize and honor those who have made significant contributions to the industry. To learn more about these events, including how to register go to oogawintermeeting.com. Registration on-site at the event will also be available. Join us this year for the 9th Ohio Oil and Gas Hall of Fame Honors Dinner during the Annual Winter Meeting being held at the Columbus Hilton at Easton. The event includes a reception, dinner and induction ceremony for the incoming class. The Ohio Oil and Gas Association Hall of Fame honors those who have made their own distinct contributions to the Ohio oil and gas industry. The Hall of Fame was established in 1987 and since then 125 honored veterans of our industry have been inducted into the Hall. The induction ceremony has been held once every four years since 1994. $125 for an individual or $200 for a couple. The Ohio House of Representatives passed HB 430 yesterday by a substantial, bipartisan margin (85-12). Why should you care? It’s important to your business because predictability and stability are crucial elements to a fair tax system, and HB 430 is a step towards protecting accepted practice and enforcement of Ohio’s tax laws and regulations. 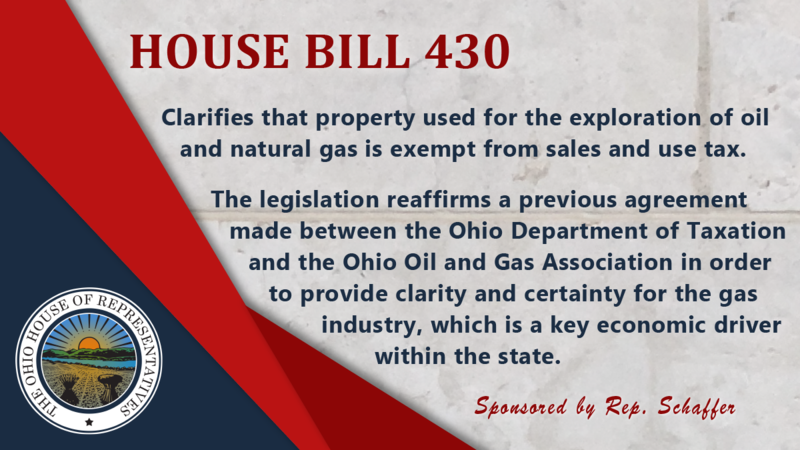 HB 430 deals specifically with the oil and gas industry, but similar concerns about shifting interpretation or definition changes are affecting other industries such as manufacturing processes and other commercial activities. Over the years, changes brought about by advanced technology have created a need to adjust Ohio’s laws and accepted practices of tax enforcement. In this vein, HB 430 is an update to legislation that first defined “production equipment” for the oil and gas regulation law. Numerous changes were made in the wake of the broad emergence of horizontal hydraulic fracturing methods in Ohio. (S.B. 165 of the 128th General Assembly). Some further refinement has become necessary. The Ohio Chamber supports these changes that simply reaffirm what the state law has been for decades by clarifying the Ohio Revised Code, as originally intended by the Ohio General Assembly, and the Ohio Administrative Code that these direct sales are treated as nontaxable. The purpose is not to expand the scope of the current exemptions or exclusion; rather it is to aggregate and clarify them. This action would bring a measure of clarity and certainty to the industry, which contributes to good business and continued business growth. We believe that it may also give a guideline for similar issues in other areas of law and regulation. The Ohio Chamber will continue working toward fair implementation of all taxes on behalf of our members and all Ohioans. The Ohio Oil and Gas Association (OOGA) and the Ohio Environmental Council Action Fund (OEC Action Fund) are both praising a bill that passed the Ohio House that would streamline the state’s idle and orphan oil and gas well program, it passed the Ohio House with unanimous support on Jan. 17. Introduced by State Rep. Andy Thompson (R-Marietta), House Bill 225 will establish a more robust and streamlined program for plugging the state’s idle and orphan wells, which do not have identifiable owners and may date back as far as 1885. The number of idle and orphan oil and gas wells in the state is estimated to be in the thousands and there are currently 700 wells on a waiting list to be plugged through the state’s Orphan Well Plugging Program, which is administered by the Ohio Department of Natural Resources (ODNR) and funded by severance taxes paid by Ohio’s oil and gas industry. ·Streamlined historical title and landowner research requirements. ·Process to allow ODNR to pay well service contractors directly, eliminating upfront, out-of-pocket costs and potential tax liabilities for landowners. ·Increased accountability by requiring ODNR to report well-plugging progress annually to the Ohio General Assembly. ·Increased program funding from 14 to 45 percent. Following passage by the Ohio House, House Bill 225 was introduced in the Ohio Senate on Jan. 22. OOGA and the OEC Action Fund look forward to working with the Senate and the swift approval of this essential legislation. Whether or not you realize the importance of natural gas, it is ubiquitous. Natural gas and products made from it are below you and all around you, a form of it is most likely on you and maybe even inside of you. It is fundamental to everyday life and becoming increasingly vital to the world’s energy portfolio. Natural gas is a fossil fuel used for heating, cooking, electricity, fuel for vehicles, a chemical feedstock in making plastics, and other commercially imported organic chemicals. This naturally occurring hydrocarbon gas mixture is found deep underground, and in the U.S. has primarily been extracted from shale rock over the past decade. 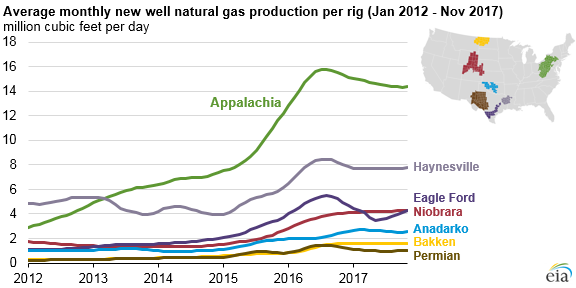 Across the Appalachian region there are two shale formations that together are producing a lot of the U.S. natural gas. The Marcellus shale extends from New York to Kentucky, covering about 95,000 square miles. The Utica shale sits beneath the Marcellus and is below us in Ohio, spanning 60,000 total square miles between New York, Pennsylvania and West Virginia. Innovations in drilling and hydraulic fracturing has advanced to the point where oil and gas production can be economic in these tight shale formations, allowing the region to become very prolific over the past years. According to new information from the U.S. Energy Information Administration (EIA) the Appalachian region is driving growth in our country’s natural gas production. Since 2012, the average monthly natural gas production per rig for new wells in the region has increased by 10.8 million cubic feet per day. A decade ago this level of production would have been unthinkable for our area. Fast-forward to today and if Ohio, West Virginia, and Pennsylvania were hypothetically to combine as a country, it would be the third highest natural gas producing country in the world. · Run 82,800 televisions non-stop for a century. · Provide electricity for 559,245 houses for a year. · Take a cross-country road trip 255,000 times. · Travel to the moon and back 12,857 times. EIA’s Drilling Productivity Report finds that natural gas from the Marcellus and Utica has increased by more than 14 billion cubic feet per day since 2012. To put that into perspective over the last five years, that’s an increase in production of natural gas from 7.8 Bcf/d in 2012, to producing 22.1 Bcf/d in 2016, and the third quarter of 2017 shows production at 23.8 Bcf/d in 2017. 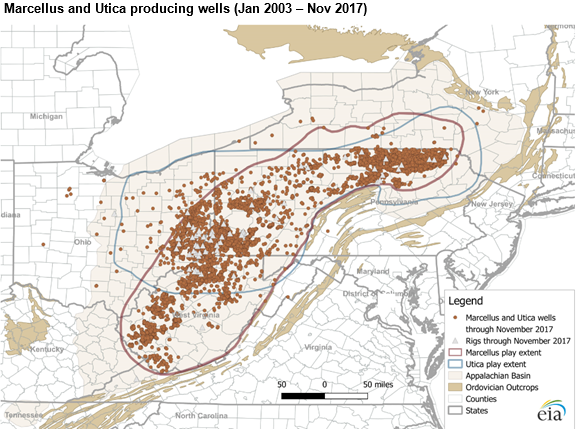 As of November 2017 more than 1,800 wells have been drilled in the Utica-Point Pleasant, and more than 11,300 wells have been drilled in the Marcellus. 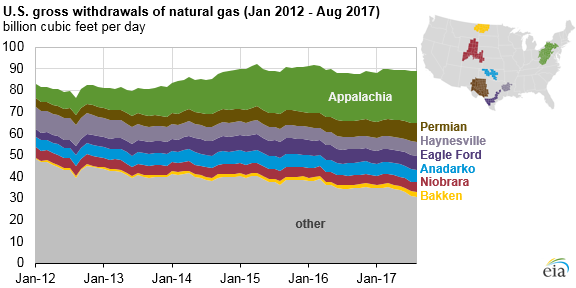 There’s still more to come as the Appalachian region continues to show what its capable of bringing to the U.S. energy portfolio. It is projected that the northeast states will account for 35% of U.S. natural gas production by 2020. It will be exciting to see our industry continue to advance techniques that will improve production and bring even more economic development across our region. The Ohio Oil and Gas Association (OOGA) hosted its annual holiday membership reception on December 14, 2017 at the Cherry Valley Lodge in Newark. The event had a great turn out and it was nice to have our members coming to celebrate the holiday season with colleagues, friends, and Association staff. Following the annual OOGA Executive Committee and Board of Directors meeting, a large representation from these groups was also present. This event is a great opportunity for groups to network, mingle, and Association members from near and far to get together to enjoy hors d’oeuvres and drinks. The OOGA thanks everyone who was able to attend the annual holiday reception and wishes all of our members a very Happy New Year! After more than two dozen failures at the local level in Ohio, the Pennsylvania-based Community Environmental Legal Defense (CELDF) recently announced plans to launch a statewide initiative petition for two Ohio constitutional amendments. The ultimate goal is to alter state law to allow local fracking bans (among other extreme objectives). While the proposed so-called “Ohio Community Rights Amendment” and the “Initiative and Referendum Amendment for Counties and Townships” garnered 1,000 signatures and was certified by the Ohio’s Attorney General, the road to a statewide ballot measure includes passing muster with the Ohio Ballot Board and would require at least 305,591 Ohio voter signatures to qualify. In other words, CELDF is on step two of the 28 total steps it will take implement an actual statewide citizens-initiated constitutional amendment. In addition, despite what CELDF claimed in a press release announcing the decision this week, the group has had nothing but failures in other “similar” attempts in other states (a fact most media outlets failed to note). When was the petition submitted and certified? And how does that process work? On Nov. 17, CELDF submitted two petitions for state constitutional amendment to Ohio Attorney General Mike DeWine, who certified the signatures on Nov. 27. These were the first and second steps in a very long process that is nowhere near complete. While CELDF would have you believe their so-called ballot measure will hit the masses tomorrow, 26 steps in the process remainleading up to the July deadline, according to the Ohio Secretary of State’s website. Notably, more than 50 percent of efforts that clear the Ohio Attorney General’s first two steps do not make it to the ballot. What do the petitions actually say? This amendment secures the right of local, community self-government for the people of Ohio by guaranteeing local authority to enact laws to protect unalienable rights and the health, safety and welfare of community members and natural ecosystems, free from state preemption or corporate interference. This right includes the power of each Ohioan to act collectively through his or her local government to alter, amend or abolish systems of law and government when they fail to protect or when they directly or indirectly violate the unalienable rights and the health, safety and welfare of community members and natural ecosystems. Following adoption of this proposed amendment, the right of local community self-government will be exercised through the adoption of county and municipal laws either directly by the people of those communities through the initiative process or by their local elected representatives on behalf of the people of the community. Under this amendment, State laws won’t have the power or authority to preempt or overturn local laws enacted to protect the rights of community members and the local ecosystem. Claimed corporate “rights” will not be able to override the rights protected by the exercise of the right of local community self-government. Local laws enacted pursuant to this amendment will not be valid if they violate or diminish the rights of natural persons or ecosystems, nor will they be valid if they reduce established protections in law for natural persons or ecosystems. This amendment establishes a right of initiative and referendum powers to residents of counties and townships, just as residents in Ohio municipalities have possessed since 1912. Has a political action committee been filed for this effort? No. Not at this time. This is significant because any legitimate effort to actually launch a statewide campaign would include a campaign committee. Have there been any other statewide ballot initiatives in other states where CELDF has been successful? No. While CELDF is aggressively trying to mislead Ohio media and the public that they have made headway “advancing” what they call “similar efforts” in other states, that’s simply not true. CELDF’s similar efforts in both New Hampshire and Colorado failed, and they only recently made attempts to implement similar initiatives in other states. And let’s not forget they have been failing for years in Ohio at the local level. The Pennsylvania-based Community Environmental Legal Defense Fund is entirely behind this effort. CELDF is the very definition of “big money.” Its coffers swelled from $1.6 million in 2014 to $2.5 million in 2015, and spent almost a million dollars on lobbying and grassroots efforts, as a result of the more than $3.4 million the group has raised over the past few years. According to its latest tax filing, the organization has seen its fundraising increase by more than 73 percent since 2009. However, new reports indicate there may be millions more in dark money pouring into its coffers. What does the language of the petitions actually mean? That’s right: if the city decides it doesn’t like your business, you’re out of business! But CELDF has proven to be anything but reasonable. 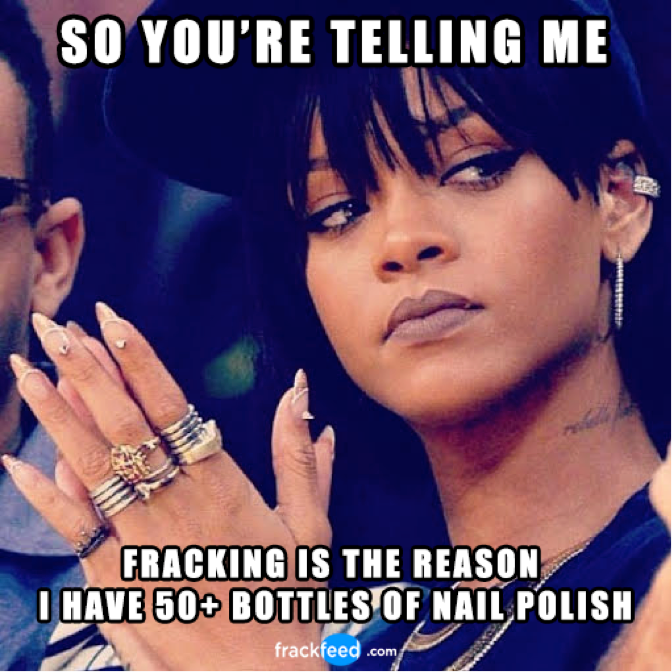 And it is important for Ohio voters to know that the group’s lack of rationality is surpassed only by its desire to ban fracking and other business activity essential to Ohio’s economy. The Ohio Oil and Gas Association (OOGA) and Energy In Depth (EID) Ohio announce the findings of an analysis of road improvements made by Ohio’s oil and gas operators through the Road Usage Maintenance Agreement (RUMA), in its second report in The Utica Shale Local Support Series: Ohio’s Oil & Gas Industry Road Improvement Payments. In total, the upstream oil and natural gas industry has spent more than $300 million in eight Ohio counties from 2011 to the first quarter of 2017, and improved more than 630 miles of roads from these investments alone. This report takes a closer look at the history and execution of these agreements within eight counties spanning from 2011 to 2017: Belmont, Carroll, Columbiana, Guernsey, Jefferson, Harrison, Monroe and Noble. This report is the second of its kind in an on-going Utica Shale Local Support Series between OOGA and EID Ohio that collectively examine multiple ways in which oil and natural gas production directly benefits local schools, counties, townships, cities, villages and other vital local services and infrastructure. Earlier this year the first report was released, which found Ohio’s oil and gas operators contributed more than $43 million dollars in six counties over five years, as a result of property taxes paid on crude oil and natural gas production. An addendum with two additional counties was added to the release report to include both Columbiana and Jefferson Counties pushing the Ad Valorem contributed number to $45 million. Combined, these two reports find the oil and gas industry has contributed more than $345 million in direct investment into counties where drilling and production of oil and natural gas from the state’s shale resources is occurring. 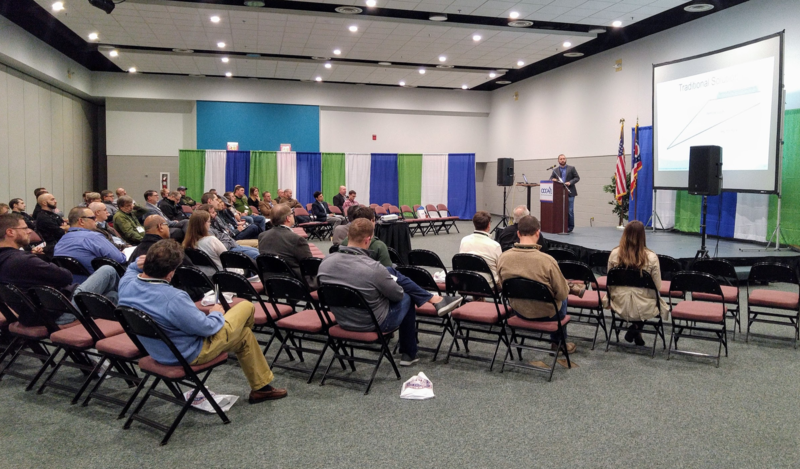 The Ohio Oil and Gas Association hosted its seventh annual Technical Conference and Oilfield Expo on November 2, 2017. For the third year, the event was held in Cambridge at the Pritchard Laughlin Civic Center. With the industry slowly recovering from the downturn, the overall attendance, as well as enthusiasm, was up over the last few years as the industry settles into the new normal. The event hosted a wide array of attendees, exhibitors, and sponsors, all contributing its success. 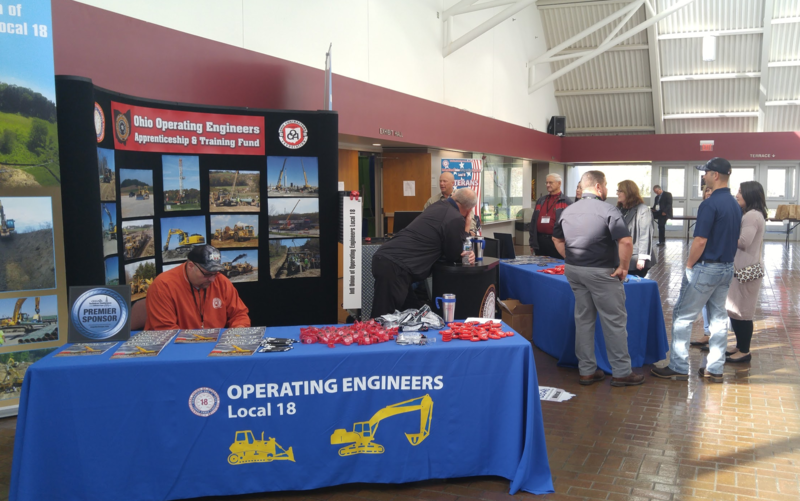 The International Union of Operating Engineers Local 18 was the event’s premier sponsor and was a key driver to the overall success of the event. The evening before the technical conference presentations, the Association hosted a welcome reception held on the exhibit floor for everyone attending. This was well attended and provided an opportunity for attendees to network, mingle, and visit the exhibitor booths while enjoying hors d’oeuvres and drinks. 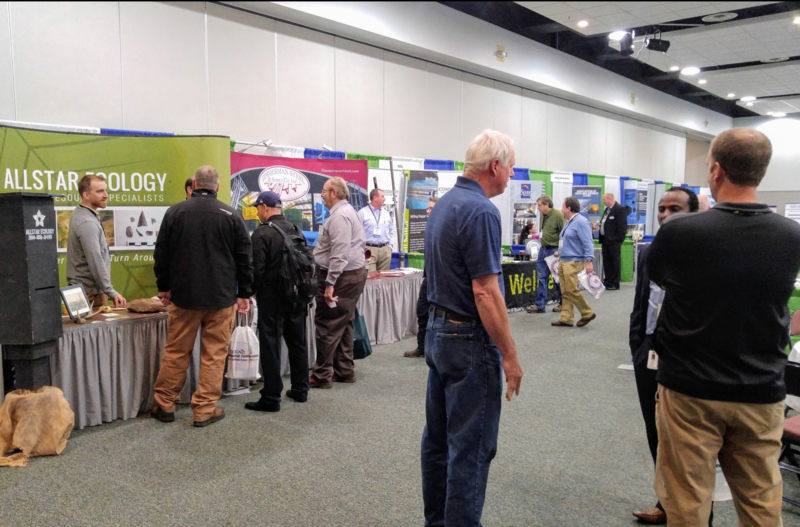 What really stole the show were the speaker presentations and panel discussions during the technical conference, providing in depth discussion on topics impacting the oil and gas industry. 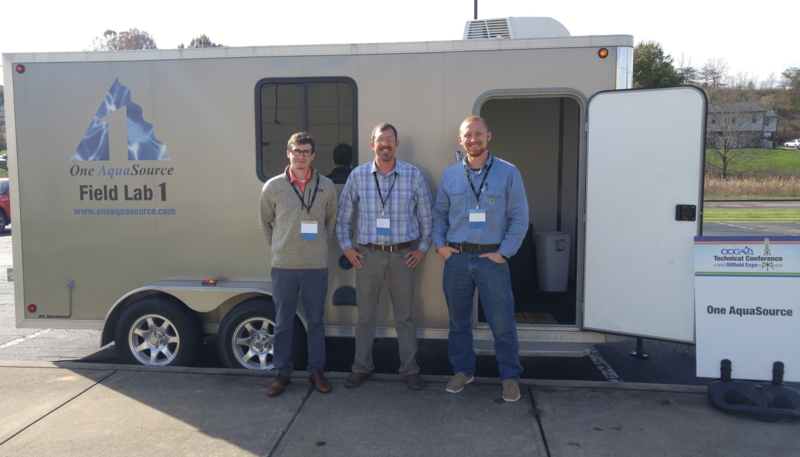 Some of the various topics at the Technical Conference included comments from experts on emergency response and minimizing costs, to overviews of pieces of equipment such as reciprocating compressors and in-pipe turbine generators. One of the key presentations was provided by Bryce Custer who is experienced in all aspects of commercial real estate. Bryce spoke on the topic site selection criteria for petrochemical and energy service facilities. “This area has the key criteria for Site Selection in terms of abundant and low cost feedstock, many suitable sites, ongoing infrastructure upgrades, a skilled workforce and most importantly, our proximity to customers along with local and state incentives” according to Custer. Every year the Association strives to bring the best and brightest to Cambridge to keep all of its members up to date on the latest and greatest innovations within the industry. This is one of the key roles the Association plays, creating a platform for its members to interact and do business. We encourage everyone to join the conversation next year and attend the event in person to hear the presentations impacting our industry in their entirety. 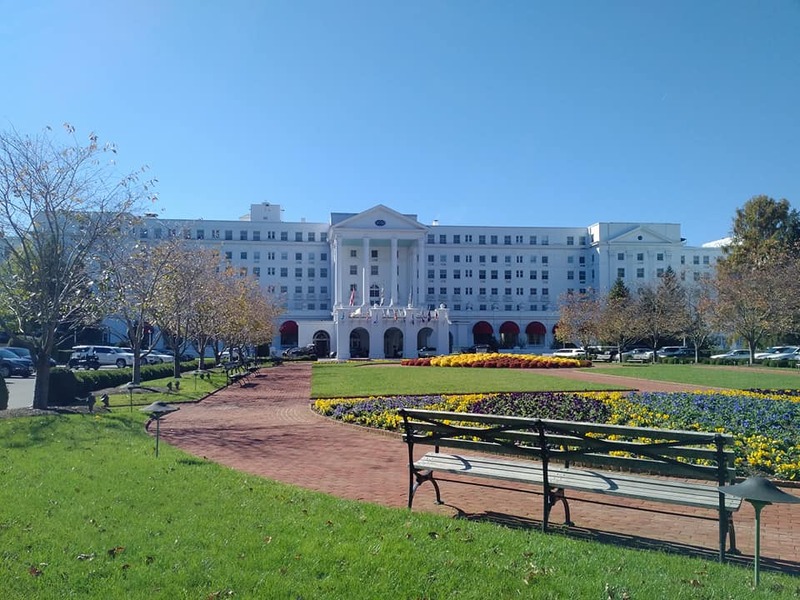 The Appalachia Chapter of National Association of Royalty Owners (NARO) recently held its annual conference at the Greenbrier Resort in White Sulfur Springs, WV. 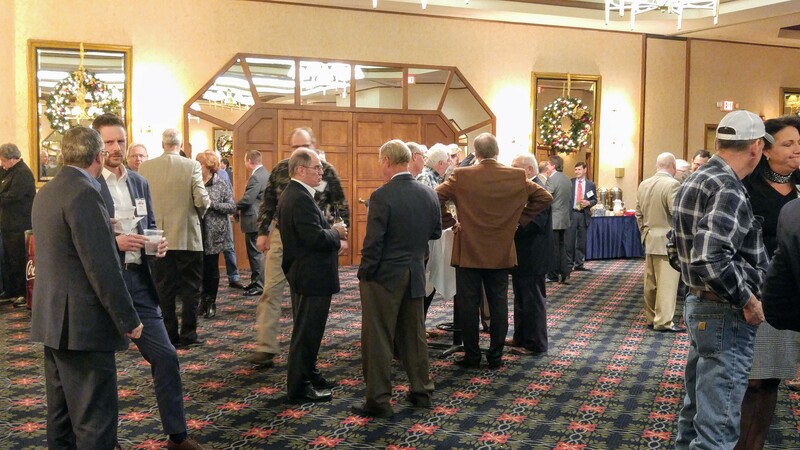 Members from Ohio, West Virginia and elsewhere attended the annual event to network and discuss current issues regarding leases, drilling activity and legislative affairs the Utica and Marcellus development area. The two day event hosted many knowledgeable speakers on a wide range of topics. Bob Orndorff, Dominion Energy; Jim Crews, Marathon/MPLX; and Brent Breon of Blue Racer Midstream sharing some insights on the topic of midstream buildout. Eclipse Resources’ Oleg Tolmachev provided a report on what his company is up to as they continue to expand lateral length and explore for resources underneath the Wayne National Forest. A legislative update from West Virginia and Ohio were provided by State Senator Charles Trump and State Representative Andrew Thompson. Energy in Depth’s (EID) Jackie Stewart joined OOGA for a talk about how to most effectively use grassroots to get your message across. Your Association and EID have a great and ongoing working relationship with the folks at NARO. Additionally, Jackie had her own session to speak about what the anti-oil and gas groups are up to these days, explaining her various efforts pushing back on their. OOGA was also able to provide a Utica Shale update discussing the status of various upstream, midstream and downstream projects and how the industry gives back to communities across Ohio. At the membership dinner, The Department of Energy, National Energy Technology Lab’s, Dr. Randall Gentry shared the various research projects he and his teams are working on how their work impacts the industry. The credit for this very successful event goes to our friend and Medina County’s own, Rebecca Clutter, NARO Appalachia Board member. Rebecca put together a very comprehensive program addressing many of the hot topics of the day. Perhaps most importantly, she addressed the audience about her working relationship with the industry in Ohio and how through combined efforts has been able to get many important items to both landowners and producers accomplished. This was a great event and we are truly grateful and thankful to Rebecca for having OOGA out to speak and to have the ability to network among friends. Following day one of exhibitor set-up all event attendees are invited to join exhibitors for the new evening networking reception that will be held on the trade show floor. OOGA would also like to thank each of our sponsors for making this event possible, with special recognition to International Union of Operating Engineers for being the event’s premier sponsor. We look forward to seeing you there, visit the event website to learn more and register online!